I’m sad to see summer go, but it means that fall is here, and I’ve got some delicious fall recipes ready for the occasion. Fall has a lot to offer in the produce department—including sweet apples and pears, tart cranberries and savory Brussels sprouts and fennel. All this fresh produce inspires me to whip up some warming dishes on cool fall nights. Deep-Dish Apple Pie – With all that delicious fruit an apple pie should be healthy, but the truth is a slice can have as much as 750 calories and 30 grams of fat. For the most part, the culprit is the crust. We use whole-wheat pastry flour to add fiber and lower the saturated fat by replacing some of the butter with canola oil. 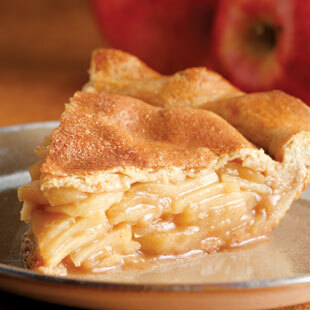 The brown sugar-sweetened filling in this pie is made with two kinds of apples for the perfect balance. A slice has half the calories of a typical version and only 10 grams of fat—sweet! Brussels Sprouts with Bacon-Horseradish Cream – These tangy horseradish-cream-topped Brussels sprouts are just the thing to serve with corned beef and potatoes, or alongside a holiday ham or turkey. Look for sprouts with tight, firm, small deep-green heads; if they're still on the stalk, so much the better. To prepare, peel off outer leaves and trim the stems. Double it: Steam the Brussels sprouts in a Dutch oven instead of a saucepan. Gingered Cranberry-Pear Cobbler – Cranberries add a particularly pleasing tartness and color to pears. Fresh ginger, lemon and vanilla brighten up the pears, while reduced-fat sour cream adds flavor to the biscuit-dough crust.